Although Saigon is one of the most modern cities in Vietnam, it still contain lots of historical monuments and old building which attract many travellers all around the world. Visiting historical monuments and old architecture isn’t always enjoyable for everyone but here in Ho Chi Minh city, there are some truly fascinating sceneries and activities for all ages. From classic French architecture to perfectly maintained American war machines, walking around Saigon is like observing the past come to life with many famous destinations of interest scattered throughout the city. 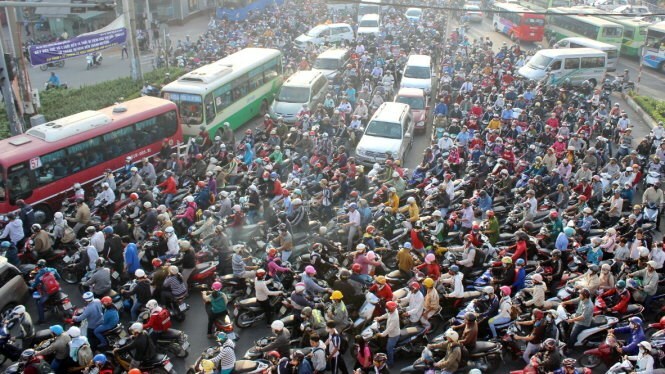 Moreover, as times are changing, the city become the business and financial hub of Vietnam, with many skysrapers growing. They combined with each other to make the new and old in uniquely Vietnamese way. 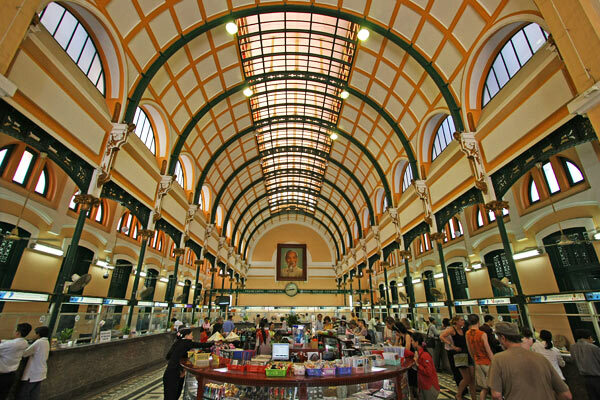 Binh Tay Market, constructed by the French in the 1880s, is located in the centre of Vietnam’s largest Chinatown district. Unlike Ben Thanh Market in District 1, this market mainly serves the local population with its extensive range of fresh fruits, vegetables, poultry, meat and seafood from regions across Vietnam. Also known as Cholon Chinatown Market, Binh Tay Market occupies a two-storey building along Thap Muoi Street. Travellers can also find an assortment of handicrafts, lacquerware, and textiles that are sold in bulk, though goods are not varied compared to other (more touristy) markets in downtown Hanoi. Along with the interesting historical and cultural aspect of Cholon, Binh Tay Market is great for experiencing the local lifestyle and sampling unique Vietnamese-Chinese delicacies. The War Remnants Museum in Ho Chi Minh City first opened to the public in 1975. Once known as the ‘Museum of American War Crimes’, it's a shocking reminder of the long and brutal Vietnam War. Graphic photographs and American military equipment are on display. There's a helicopter with rocket launchers, a tank, a fighter plane, a single-seater attack aircraft. You can also see a conventional bomb that weighs at 6,800kg. American troops had used these weapons against the Vietnamese between 1945 and 1975. War Remnants Museum Highlights The most talked-about exhibits at the War Remnants Museum are the ‘tiger cages'. The South Vietnamese government kept their political prisoners in these confinements. 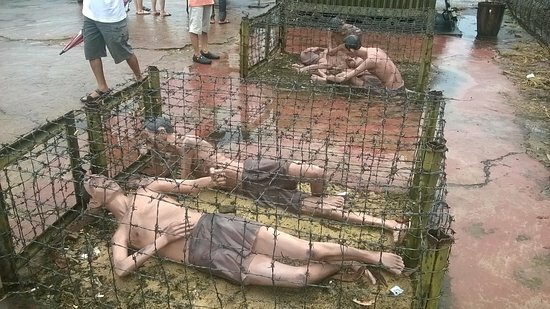 Locals believe the cages imprisoned up to 14 people at a time. The museum also has a guillotine brought in by the French government. Both the French and South Vietnamese used it to execute their prisoners until 1960. Also featured are grisly photos of victims that had suffered ‘Agent Orange’. As many as 4.8 million people were exposed to strong pesticide and chemical spray. The Vietnamese Ministry of Foreign Affairs believed 500,000 children were born with birth defects. The War Remnants Museum is in District 3, Ho Chi Minh City. It's every day from 07:30 to 17:00. A visit to this war museum can be disturbing experience for most people. Although children can enter, we highly advise against it. It is now one of Ho Chi Minh’s most iconic attractions. You can enjoy plenty of activities during your visit. A popular option is following the narrow routes of the underground tunnel. Before entering the underground tunnels, visitors watch a short film of Chu Chi Tunnels so that they understand how the tunnel system works. Parts of Chu Chi Tunnels are also cemented and widened, so that the crawl is less harrowing than it would have been in the past. There are emergency exit points every 10 meters for safety. Do note that the 100-metre crawl through the underground tunnels may be unsuitable if you have breathing difficulties. The Chu Chi Tunnels also host a shooting range. The cost for firing an M16 rifle is priced at VND 35,000 per bullet, with a minimum of 10 bullets. There's a restaurant serving meals that the underground soldiers had to live with years ago. The Chu Chi Tunnels are an hour's drive from Ho Chi Minh City. There are tour operators that can arrange for a half-day tour for VND 825,000 upwards. There are nine hierarchies of worship including a pope, cardinals and archbishop with festivals, rituals and prayer all practiced regularly. The temple is similar in design to a Christian Cathedral featuring side aisles and an altar, as well as a long central nave, all positioned as they would be in a Christian Church, there is even a high dome decorated with clouds and saints. The main focal point is a Divine Eye symbolising God which has the Ying and Yang icon in its pupil. Ceremonies take place daily with two services accompanied by musicians and a choir singing in English to traditional Vietnamese music. The temple is best visited by booking a tour due to its location close to the Cambodian border, 100km northwest of Ho Chi Minh City in the Long Than village close to Tay Nihn. Worship takes place every six hours and starts at midnight with chanting at 06:00 and 18:00 daily. Visitors are permitted to watch from the galleries and may take photographs, knees must be covered and shoes removed before entering. Silence is requested when a service is taking place. The Cao Dai Temple is one of 1,000 Cao Dai Temples located in Vietnam. 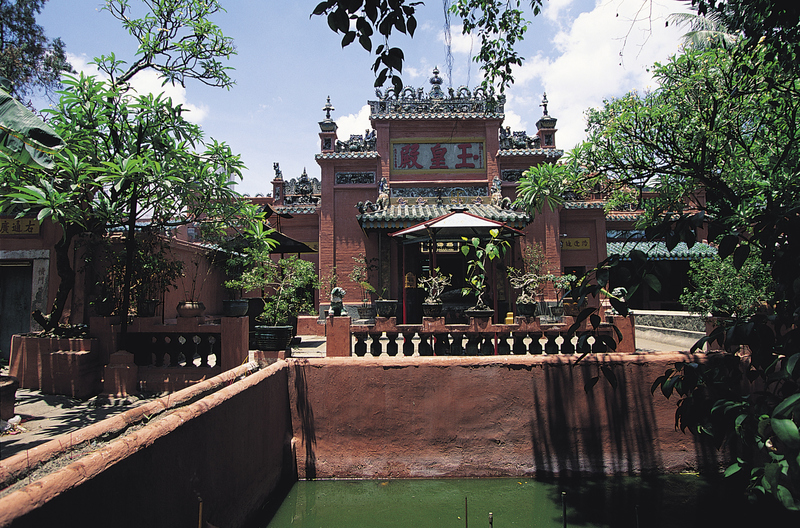 Emperor Jade Pagoda, also known as Tortoise Pagoda, is one of the five most important shrines in Ho Chi Minh City. Built at the turn of the 20th Century by a community of Cantonese who migrated from Guangzhou province in Southwest China, this pagoda is a fine representation of Mahayanist branch of Buddhism that is practiced widely in Vietnam. Jade Emperor Pagoda In the main hall, the Emperor Jade Chua Ngoc Hoang or the 'God of the Heavens' reigns supreme. Aided by two assistants, the Emperor decides who can enter this higher realm. Those who don't pass this gate will meet with the formidable 'God of Hell', on the left, who will send sinners to one of the 10 levels of hell. Life in purgatory is magnificently if somewhat gruesomely represented by the intricate carvings on the temple wall, depicting different kinds of punishments that await transgressors. Ho Chi Minh City’s Bitexco Financial Tower & Skydeck stands 262 metres high at the centre of the city’s business district and offers visitors an unparalleled city view from its Skydeck. Designed by renowned American Architect Carlos Zapata, this 68-storey tower houses offices, shops, restaurants, and a helipad. CNNGo recently ranked the building fifth in their listing of the world’s 20 most iconic skyscrapers. The structure also received an ‘Excellence in Structural Engineering’ award from NCSEA in 2011 and is currently the 124th tallest building in the world. The main attraction at the tower is the Skydeck where visitors can enjoy dramatic views across the bustling city below. Bitexco Financial Tower Six of the Bitexco Financial Tower floors have been given over to retail space although the main draw here is not shopping, rather the views. The public observation deck on the 49th floor is reached by using one of the tower’s 16 elevators which can reach any floor regardless of level within 35 seconds. The Skydeck delivers breathtaking 360 degree views across the city and the Saigon River. Visitors can also use one of the binocular stands to get a closer look. Great views are also enjoyed from the 50th and 51st-floor restaurants, particularly at night when the metropolis below glitters above. There are also local art exhibitions held on the Skydeck, where you can also purchase souvenirs, including textiles and locally produced tea. Reunification Palace was the base of Vietnamese General Ngo Dinh Diem until his death in 1963. It made its name in global history in 1975. A tank belonging to the North Vietnamese Army crashed through its main gate, ending the Vietnam War. Today, it's a must-visit for tourists in Ho Chi Minh City. The palace is like a time capsule frozen in 1975. You can see two of the original tanks used in the capture of the palace parked in the grounds. Reunification Palace was the home and workplace of the French Governor of Cochin-China. It has lush gardens, secret rooms, antique furniture, and a command bunker. It's still in use to host important occasions in Ho Chi Minh, including APEC summits. The Reunification Palace has five levels. The basement features tunnels, a war room and telecommunications centre. The war command room has original maps on its walls. Period telecommunications equipment are also on display. Its adjoining basement rooms display war propaganda materials. On the third floor, there's a card playing room while the fourth houses a casino. Reunification Palace's rooftop terrace is fitted with a heliport. The Reunification Palace is open from 07:30-12:00 and 13:00-16:00. You can buy tickets at the main gate, located on the east side of the palace gardens. Security will check your bags for safety reasons. Free guided tours are available in English, French, Japanese and Chinese. The palace is on Man Ky Khoi Nghia Street, close to the Ben Thanh Market. 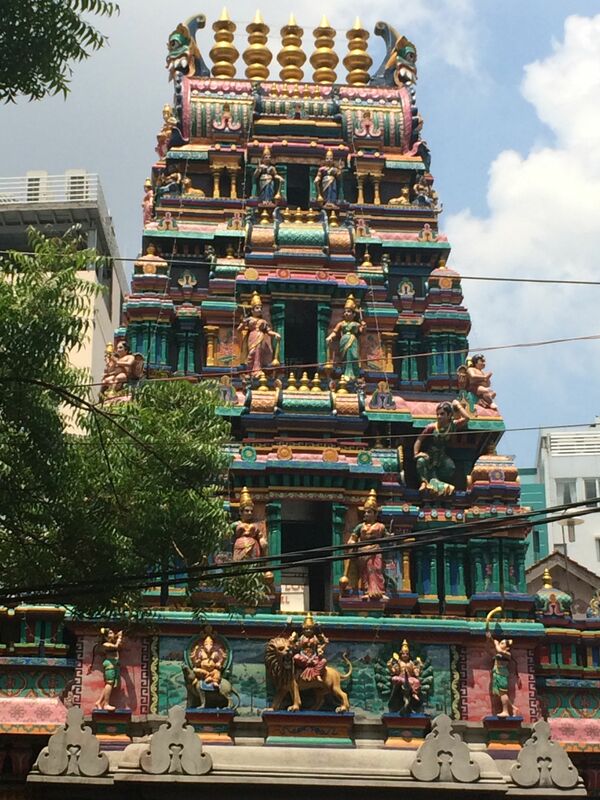 Mariamman Hindu Temple is a sacred Hindu Temple dedicated to the goddess of the Rain ‘Mariamman’. This temple was built in the late 19th century by traders coming from India and has been well preserved. This complex is the only Hindu temple in Saigon and is believed to have miraculous powers giving luck and wealth to its visitors. The outer wall of the Temple has a collection of interesting statues of different gods and goddesses like Mariamman, Vishnu, Brahma and Ganesha. The main hall of the complex (The Rajagopuram) stands twelve metres tall and inside you find a well maintained statue of Mariamman flanked by her protectors ‘Maduraiveeran’ and ‘Pechiamman’. If you would like to enter the Mariamman Hindu Temple than do not forget to take of your shoes and dress appropriately. To favour the goddess of the rain you can also take some offerings such as joss sticks, jasmine, lilies and gladioli. These can be bought in front of the entrance. In the near vicinity of this temple you can also find Ben Thanh Market. Entrance to the temple is free of charge and can be visited from 07:00 – 19:00.